After clashing violently with Government troops in the capital Kinshasa last month, opposition forces and their dependents in the Democratic Republic of the Congo (DRC) currently under United Nations protection have disarmed, the world body's Department of Peacekeeping Operations (DPKO) said today. The UN mission in the DRC, known as MONUC, estimates that hundreds were killed and many more wounded in the violence which broke out on 22 March between Government forces and guards of former Vice-President Jean-Pierre Bemba, who was defeated last year by current President Joseph Kabila in the run-off round of landmark presidential elections. 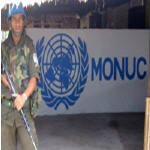 As of 30 March, 149 opposition fighters, called DPP, have taken refuge with MONUC. In addition to those DPP members, some 93 women and 109 children who claim to be family of DPP members have also taken refuge with MONUC. "The Mission is in discussions with the Government regarding [the opposition forces'] handover to Government authorities for disarmament or reintegration into the armed forces," Michele Montas, Secretary-General Ban Ki-moon's spokesperson, told reporters in New York today. Mr. Bemba's guards have yet to be handed over, as a detailed agreement is currently being negotiated by which the Government would guarantee to respect the opposition forces' human rights and their proper treatment before the law should they be tried, as well as giving MONUC's human rights officials access to them. Yesterday, MONUC called on Government officials to ensure that the country's security forces act in accordance to the law and not create an atmosphere of persecution against people associated with the opposition or those originating from Equateur province, an opposition stronghold. "It is crucial that the fundamental rights of individual security and liberty, as well as the liberty of opinion and expression, which are guaranteed by the DRC constitution, should be respected by all the security forces in relation to Congolese citizens, which includes members of the opposition and the press," MONUC spokesperson Kemal Saiki said. On Tuesday, the Security Council called on the DRC's authorities and political parties to pursue national reconciliation and resolve their differences through dialogue. Deploring the March violence, the 15-member Council underscored the legitimacy of the DRC's democratically elected institutions. The body also pointed out that these institutions must operate with respect for the rule of law, human rights and international humanitarian law, and must also avoid any unnecessary or disproportionate force. The country is rebuilding following the end of a six-year civil war, widely considered the most lethal conflict in the world since World War II, which cost 4 million lives in fighting, hunger and disease.